The average horse generates more than two gallons of urine and 30 pounds of manure a day. All that waste has to go somewhere, and in a stall environment, that “somewhere” is usually into a pile of pine shavings on top of a rubber floor mat. Now, no one expects a boarding stable to smell like a lilac grove, but it shouldn’t bring tears to your eyes, either. When drainage is poor, or stalls aren’t mucked out regularly, the resulting ammonia fumes and bacteria build-up can be irritating at best and harmful at worst – for horses and humans. Bedding material is obviously important, and you’ll want the most absorbent you can afford – sawdust or pine shavings are ideal. And while you certainly don’t want to skimp on all that waste-absorbing bedding, it’s worth noting that the thicker the floor mat, the less bedding you’ll need. One major cause of stall odor is urine pooling under the mat. Foam and rubber mats provide dual benefits of cushioning tired joints and reducing the amount of bedding needed, so don’t get rid of them. But if pooling is a problem, the mats will need to be lifted, cleaned and allowed to dry completely. This will help reduce odor and disease-causing bacteria in waste trapped under the mats, but it’s also time and labor-intensive. To give your horses all the cushioning benefits of a mat without the potential pooling problems, consider a waterproof top cover. This is a single piece of tough, woven fabric made to fit wall-to-wall on top of a foam or rubber mat within the stall. The top cover creates a “moisture tray” that allows urine and feces to be captured on top and easily removed with the bedding. In addition to getting rid of all that odor and bacteria-producing waste before it has a chance to run under the mat, you’ll also reduce the amount of shavings needed for bedding, labor to muck out the stalls, and disposal costs. Foam mats like SuperStall®, and rubber mats like EquiSoft® by IGK Equestrian, come with top covers that can be custom-sized for any surface, from a standard 16’ x16’ box stall to a 12’x24’ foaling stall. They do a great job of keeping “stall stench” to a minimum. 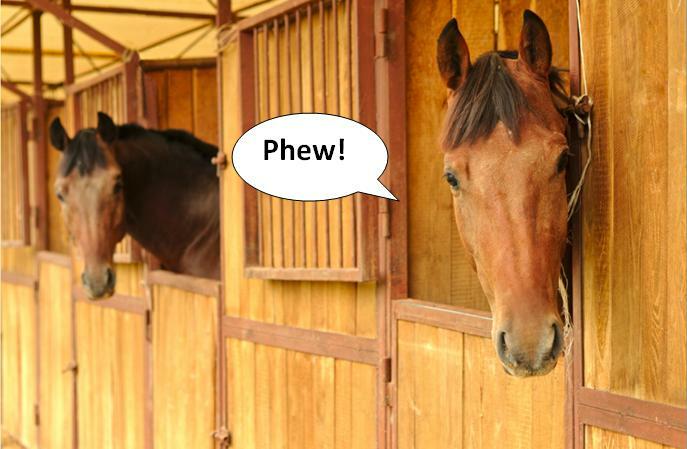 How do you manage stall odor? We occasionally hear from riders and trainers about mishaps on arena floors when the temperature drops below freezing. The risk of freezing is highest with materials with too many fine particles that tend to compact, like topsoil. The risk is somewhat lower with sand, wood chips/sawdust and stall waste. Rubber and stone dust-based footings rarely freeze, although waxed footings can stiffen up a bit. Then there’s the whole issue of watering in sand arenas: water too often and you end up with an ice rink; water too little and your riders choke on dust. The best footing material for cold climates has a) a low freezing point, b) drains well, c) resists compacting and d) needs little or no watering. Owners of arenas in these areas may want to consider a fiber/rubber amendment like SoftShoe® byIGK Equestrian. By incorporating fiber/rubber into your new or existing riding surface, you’ll not only lower its freezing point, but also help reduce compaction for greater stability in all types of weather. And, of course, the less sand in your footing, the less often you need to water. Share your frozen footing stories – and solutions – here!